The foot is comprised of a highly complex combination of structures that serve to give us balance, stability, movement, carry our weight and act as shock absorbers.Working together, the bones, muscles, ligaments, tendons, blood vessels, nerves, skin and soft tissue all contribute to the complicated mechanisms that allow us to walk, run, and function normally in our lives. The foot is divided into parts with each having its own function; these are the forefoot, the mid foot and the hind foot. The foot itself contains 26 bones, 33 joints and around 100 muscles, ligaments (connecting bones to other bones),and tendons (connecting muscles to bones), along with a complex network or blood vessels and nerve supply. The forefoot includes the 5 toes, or phalanges, the metatarsal bones, the big toe and its structures, known as the hallux and it is this part that takes almost half of our overall bodyweight and allows us to balance.The joints between the phalanges and the metatarsal bones allow us to assume a normal walking pattern, particularly the joints of the big toe. This area is especially susceptible to injury or developing mechanical problems over time. 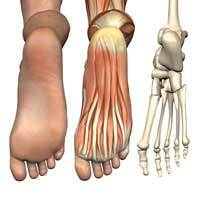 The mid foot is made up of the 5 tarsal bones, the foot arch and absorbs any harsh impacts on the feet. These bones and joints allow us to walk on uneven surfaces as they change their shape to accommodate their surroundings. This area is comprised of three joints and acts as a link between the foot and the ankle, and is where the bones of the lower leg, the tibia and fibula meet the foot and ankle. It is these joints that allow the foot to move up and down and from side to side. It contains the largest bone in the foot, the calcaneus. Made up of collagen, the tendons and ligaments are vital to the foot and have an appearance of rope, or fibrous bundles. The stronger the tendon or ligament, the tougher and thicker its appearance.These structures give feet their flexibility, allow for movement and serve to absorb impact. The large Achilles tendon that is connected to the heel bone gives us movement to raise ourselves onto our toes, whilst the tendons surrounding the toes allow for the toes to bend and stretch.Many of the muscles of the feet work in partnership with those of the lower leg, allowing us to either walk, run or remain static. The purpose of a nerve is to permit us to feel sensations and to send messages to other parts of the anatomy.There are many nerves within the foot, some ensuring we can feel the surface we are walking on, others to tell the muscles when to contract and relax. As with all blood vessels, their purpose is to carry oxygen and nutrients to the tissues and to carry away the deoxygenated blood to the lungs where it can be re-oxygenated. Muscles, bones, ligaments and tendons cannot function if they have an inadequate supply of blood and the soft tissues of the foot would not survive without it. This gives a very brief overview of the basic anatomy of the foot. As it is so complex, it is always at risk of damage and should be protected where possible.